…This is a second study on a flag for unity in New Zealand (Aotearoatanga), which could also double as a republican flag. The flag is, again, based on both the actual flag of New Zealand and the Tino Rangatiratanga flag. 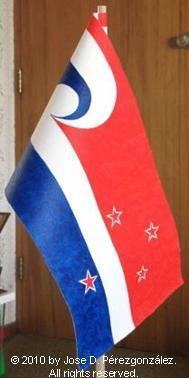 The Tino Rangatiratanga flag provides the background design for the flag while the national flag provides the blue (which substitutes the black of Tino Rangatiratanga) and the Southern Cross, while dispensing with the British flag in the canton. The ordering of the colours are inversed, in comparison to those in Study one. …The meaning of the flag is, thus, one of unity of "two" peoples in the same country. The red represents the indigenous people, the Māori, and the soul of New Zealand's most recognizable cultural elements (haka, moko, hongi, koru, etc). The blue represents the people who came after, the Pakeha and, by inclusion, modern immigrants, as well. White represents the meeting of both peoples and the Treaty of Waitangi. The Southern Cross represents the location of New Zealand in the Southern Hemisphere. …This design, placing the darker blue at the bottom, seems to be more satisfying, visually, although not for the Southern Cross (although this could be made into blue, if necessary). The main limitation of this unity flag is that it resembles the flags of Croatia, The Netherlands and Paraguay, among other regional flags. Thus, it is not readily identifiable as New Zealand's either. Also, the lack of contrast of the Southern Cross may affect its identifiability even further.